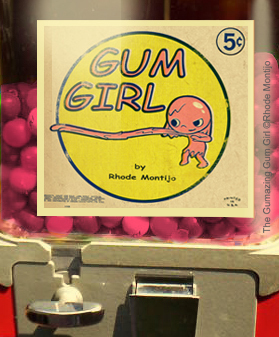 The Fantasmical Rhode Montijo Blog: SECRET ORIGINS: THE GUMAZING GUM GIRL! SECRET ORIGINS: THE GUMAZING GUM GIRL! 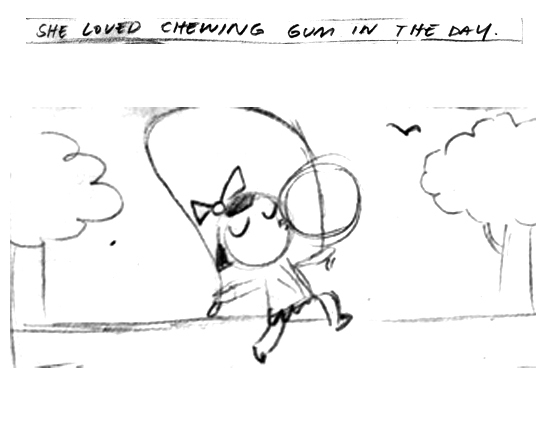 I'm currently in Japan working on the animation for THE HALLOWEEN KID Animated Special, but today my latest children's book, THE GUMAZING GUM GIRL hits the shelves! I thought I'd take some time to share how this book was born and celebrate its arrival! Around 2007, after my first children's book CLOUD BOY had been released by Simon & Schuster, my editor contacted me and asked if we could do a companion book (not a sequel) for CLOUD BOY. 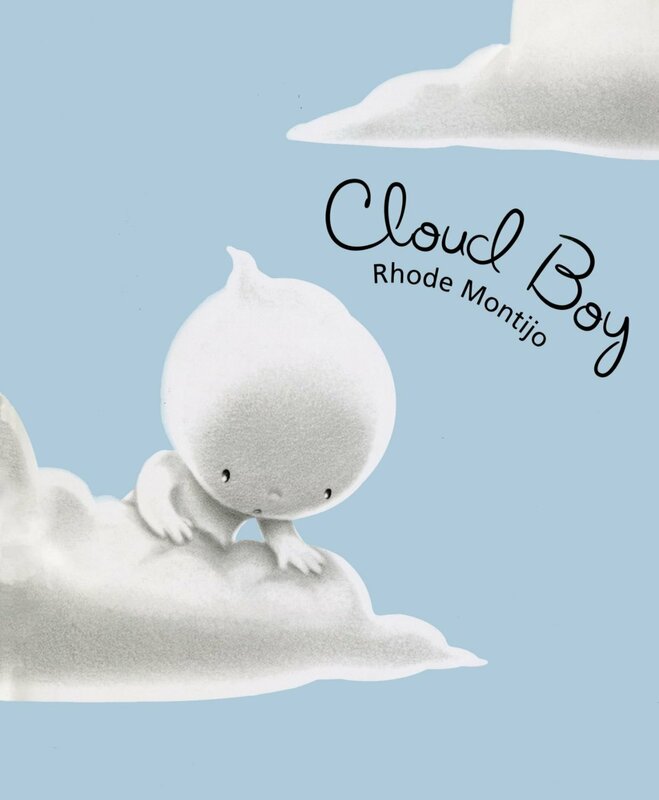 Since CLOUD BOY took place in the clouds, it was light blue in color so my editor posed the idea of simply having a pink book. For me, the quickest thing that came to mind for the color pink was gum, so that's when I came up with Gum Girl- and with the name to match the title of Cloud Boy (Cloud Boy, Halloween Kid, Gum Girl- lots of original titles here folks!) I pitched the concept to my editor (there was no story, just an idea) and it didn't quite stick! 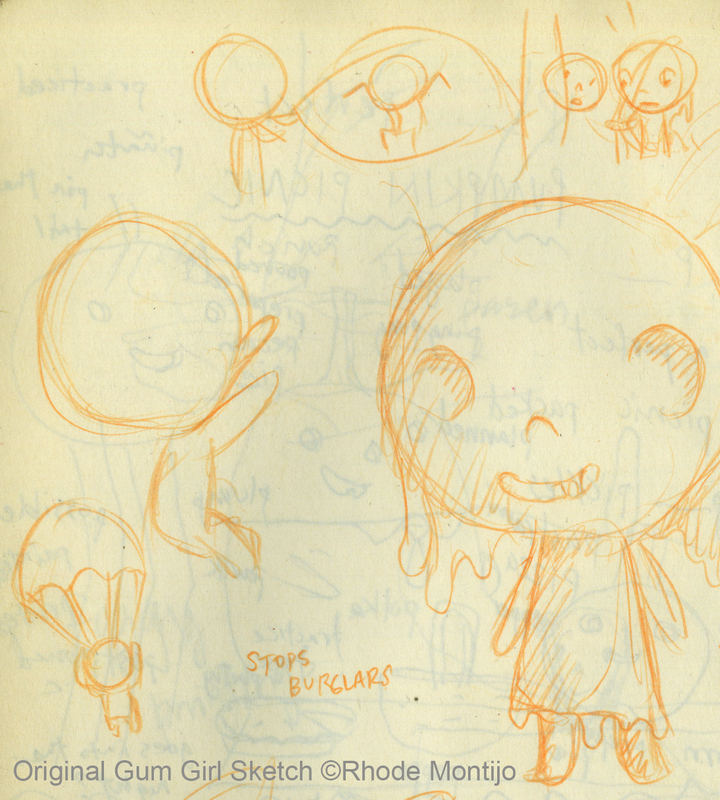 I later sketched Gum Girl in my sketchbook and kept thinking of adventures. She pretty much looked close to what we see today, except with no eyeballs!?!?! Years later, after my editor was let go from Simon and Schuster I had no other option than to start over and go back knocking on the doors of the publishing world again. 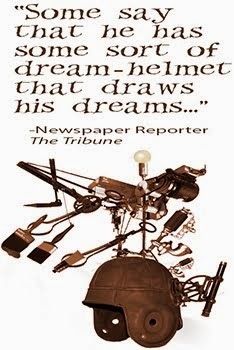 I had just finished on the last of 8 books in the MELVIN BEEDERMAN SUPERHERO books around this time and I was hopeful for work, but nothing happened...for awhile. I didn't give up and kept trying. I didn't realize 'till after my editor was let go that I was so lucky to have someone who believed in my (sometimes quirky) stories, because not everyone took warmly to them. I searched and hustled for around two years and was pretty close to jobless, taking on a few small gigs here and there to survive, but no new children's book work was close to happening. I was hurting for work, but most of all I just wanted to do more books. 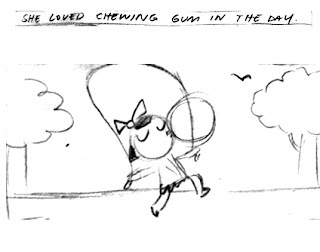 Finally, I came across a publisher that was interested in a few ideas, including Gum Girl. 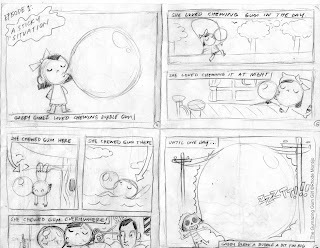 I drew out the first adventure, (pretty much what is in the current chapter book) but as a sequential story (comic book style!) and sent it off to them. I didn't hear back from that publisher and didn't even get a letter to say they received it. When you've been jobless, a month seems like forever. Around this time my old editor resurfaces and I get a call that I'll never forget. "Let's make some books!" he said after explaining his leave of children's books and his triumphant return two years later, this time at Disney Hyperion. I pitched them all my book ideas and they responded quickly (Side note: Pitching meant showing loose-sketched mock-ups of the stories that could be flipped through along with a separate manuscript). He told me that he had some good news and bad news. 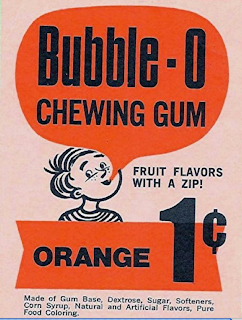 I asked him what the good news was and he explained that they wanted Gum Girl! He said that they were thinking it would work better as a chapter book. I was beyond excited! He then explained what he called bad news- I was expecting the worst and he explained further, "They want three of them…"
WHAT?! Three books?! I went crazy and asked how this was bad news? He explained that they wanted them fast! I could hear his excitement on the other end of the phone and it was nice celebrating this news. I had been pretty much jobless for two years and now I was getting offered a 3 book deal. I couldn't believe it! Even though I did not feel confident with writing something longer like a chapter book (I had only written picture books up until then) I appreciated them taking a chance. I explained that I HAVE to make it work! Fast forward and with LOTS of help from my editor...LOTS! 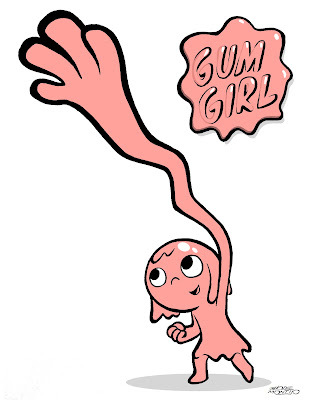 We have the new GUMAZING GUM GIRL out today! It was a lot of work, but I'm SO proud of this book. For one, the fact the book features a Latina as the main character is huge! I always wanted to share stories and characters that mirrored my culture, but nobody would take chances with those stories. I was once encouraged by another publishing editor to change the nationality of a Latino family in one of my other stories to a caucasian family and I turned it down, even though I needed work. I was upset at the suggestion, but kept my cool and tried to explain that I felt that the demographics of today did not match the output of children's books that were being put out. So this is why this is a big deal to me- someone finally took a chance! 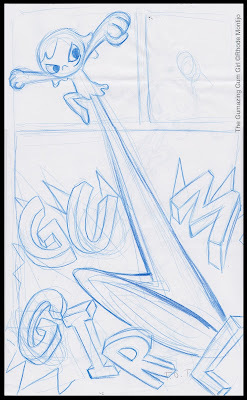 Gabby Gomez is Gum Girl! On top of this, I had sprinkled some Spanish words in the original manuscript and to my surprise I was asked to put more Spanish (which I did not hesitate to do!) but this showed me early on the belief and support that I had with this book! I couldn't believe it! Readers can hopefully see that having the main character and/or the inclusion of some Spanish words does not alienate anyone, but hopefully, rather widens the vision to the beautiful spectrum of other ethnicities that are out here and I hope that in some small way to convey that anybody can be a hero! Thank you for reading and thanks always for your support! 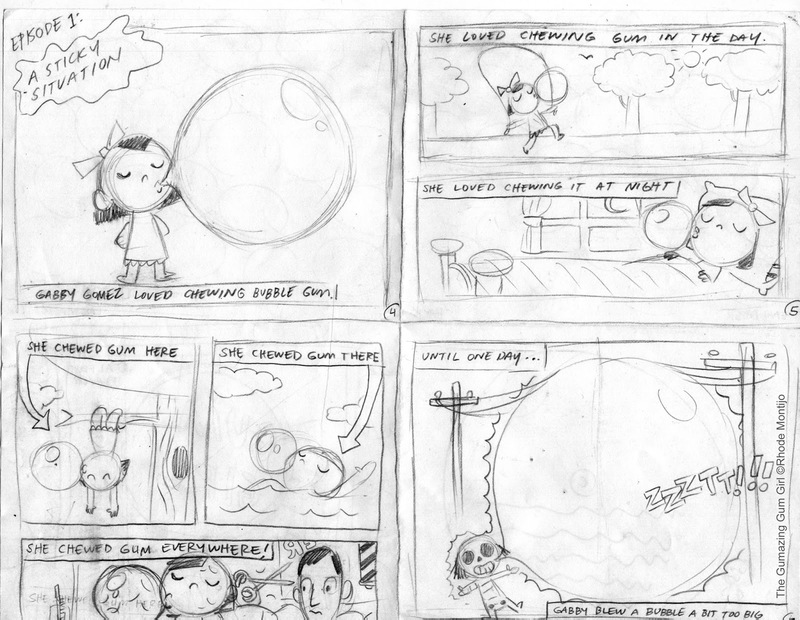 Below are some more images that were made in the process of making the book. 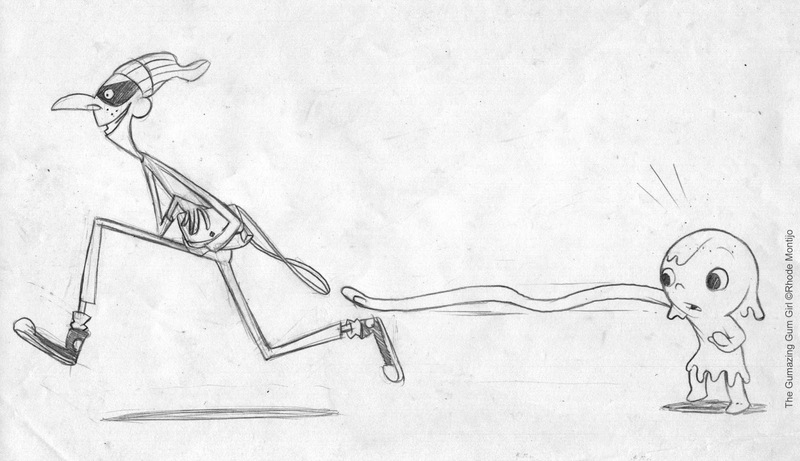 Process: Here's a quick peek at the process. Here's the final after it is inked and scanned. 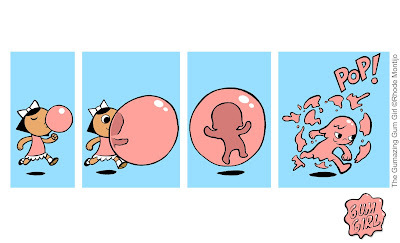 The pink color is placed digitally in Photoshop. The designer adds the text and the page is ready to go! MAKE SURE TO PICK UP THE GUMAZING GUM GIRL TODAY! or check it out at your local library! I just read this book tonight to our children. I love, love, love your writing. The kids were all super engaged and the older ones said how they loved that they wanted to know more what happens. Thanks for the great work you do! We hope you will make this into a series. I am a little late jumping on the Rhode bandwagon, but you have become a huge inspiration to me. As someone who is also a minority, good for you, for sticking to your guns. I'm working on a project of my own, with an Asian lead. We read the Gumazing Gum-Girl to our 3-yr-old and he LOVED it (and we did too)! 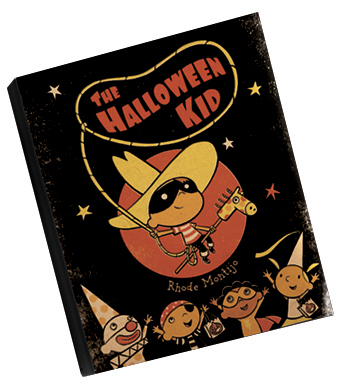 That was months ago, and he can't wait for the next installment-- every time something reminds him of it (for example, every time we read the Haloween Kid :) he'll ask us "when is the next Gum-girl coming out?" Today he asked us "what's taking so long?" We laughed and explained that making a book takes a long time, but we thought you might enjoy knowing that you have some very big fans eagerly awaiting your next book! (And that's not just our son, that includes his parents, too. :) It's wonderful work, and we love her latina side, and we're very happy to think there will be more of it. Congratulations!